Lightworkers and crystal healers who have worked with Brandberg crystals report that these crystals have an energy signature that resonates at a higher octave than normal amethyst. Brandberg amethyst is famous for imparting clarity, healing energy and connecting the bearer to the "peace that passeth understanding", making these gems ideal for meditation. The combination of smoky quartz and purple-violet amethyst activates and energizes the lower three chakras and the crown chakra simultaneously, providing a unique experience. In meditation you feel well-grounded and yet experience an intense opening to Higher Mind. This rare, gorgeous, energetically powerful Lovely Phantom Quartz Point measures 1.5 inches high and weighs 33 grams, or 1.16 oz. You can see a beautiful inner landscape with pronounced white chlorite phantom formations. This Polished Multiple Phantom Quartz Cabochon contains unique white chlorite inclusions within the crystal. Chlorite is a purifier, dissipating the energy of anger, hostility or exasperation associated with unresolved karmic issues and imbalanced past relationships. The chlorite in this crystal enhances the phantom's ability to release energy blockages related to our past pain and suffering. This type of crystal scepter was used by ancient high priests and priestesses as a mark of their spiritual station. Such scepters were traditionally used as energy transmitters and library crystals, providing spirit workers with access to Timeless Wisdom Teachings and to Spirit Guides residing in Higher Worlds. 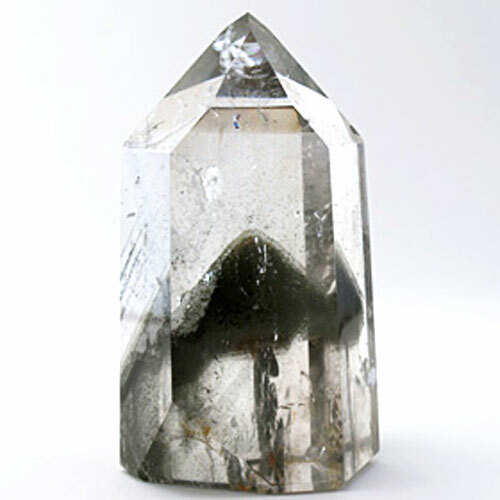 This Polished Phantom Quartz Cabochon contains unique white chlorite inclusions within the crystal. Chlorite is a purifier, dissipating the energy of anger, hostility or exasperation associated with unresolved karmic issues and imbalanced past relationships. The chlorite in this crystal enhances the phantom's ability to release energy blockages related to our past pain and suffering. This unique Polished Phantom Polished Cabochon contains a series of beautiful translucent pyramidal points within it resembling a holographic image.